For the first time, I am writing in the diary after dinner. Another busy day today; mostly driving. We began the day with breakfast in the Talland Bay Hotel in Cornwall. We decided we’d had enough of the coast so headed inland to Bodmin Moor. 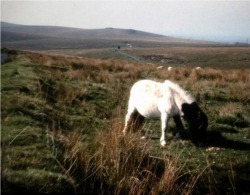 As we zipped across the moor at 60 m.p.h., we tried to imagine Mary Yellan of Jamaica Inn in a stagecoach in the rain at night, dashing across the moor. We stopped at Jamaica Inn, which unfortunately was closed due to the early hour. However, we walked around the grounds and tried to remember highlights from the book. W also discovered that the Inn is a B&B – if we had known we would have tried to stay there. 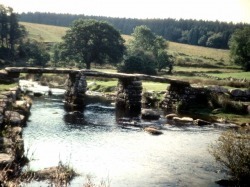 After Bodmin Moor, we headed east and south to Dartmoor. 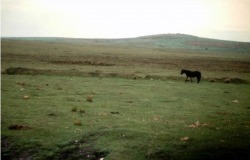 Dartmoor was much wilder and more scenic, with ponies, sheep, and cattle grazing right near the road. The views went on for miles and the clouds began breaking up. Looks like a great place to have a hike; unfortunately we were short on time. On to Exeter, where we had lunch and walked around town. We toured the cathedral, which had beautiful stained glass and fan vaulting. More folks buried beneath the floor! We also stopped at the Ship’s Inn. Sir Francis Drake mentioned it in his memoirs – “Next to mine own ship, I like the Ship’s Inn best”, or something to that effect. Established 1587. And I thought McSorley’s (NY) was old! Then north on the M5 .What fun driving! I was doing 85 mph and being passed very often. Everyone very polite. As can be imagined, we got north quite fast. Arrived here at the Chase Country Hotel just south of Stratford - Upon - Avon around 5. The hotel is nice but not first-first-class. We jumped right back in the car again to try and see some Cotswolds towns down south. Drove to Chipping Norton, Upper and Lower Swell, Stowe on the Wold, but the most impressive was Chipping Campden. Thatched roof houses ca. 1500! After watching the sunset, drove back to Stratford for dinner. We didn’t feel like a stuffy dinner at the hotel, so went downtown for a pub bite. Stopped in one place and it wasn’t till we sat down that we realized it was a chain steak place! Meal was good, though. Then up to The Old Thatch Inn for a Guinness for dessert. Last night’s dinner was quite good. We had coffee and after-dinner drinks in the bar with a British couple who were quite friendly. Shower in the room tonight; Jill is very happy! This place looks like a 19th c. country manor. Nice views. The English need some design help with their décor – bedspreads in particular!